bulaklak Garden of mga sanggol. A bulaklak garden of babies.. HD Wallpaper and background images in the kalugodlugod na sanggol club tagged: babies flowers art anne geddes photography. This kalugodlugod na sanggol wallpaper contains garden nastursiyum, indian cress, Tropaeolum majus, bigonya, pranses amarilyo, and Tagetes patula. What a fabulous garden ! But what a work too ! Ha Ha Ha I never Seen This Before its Awesöme Thanks Karen.! Hey Vic I dream or you said Thanks ? I Said Thanks 2 Karen I never Said Thanks 2 you Never.! Hai Yöu Böth Make Cookies & I Dö The Garden.!
" A Day Withöut Teasing Sylvie, That Day Is Wasted "
Bcoz She always Make Me Happy & Give Me A Big Smile.! :-):-):-):-):. 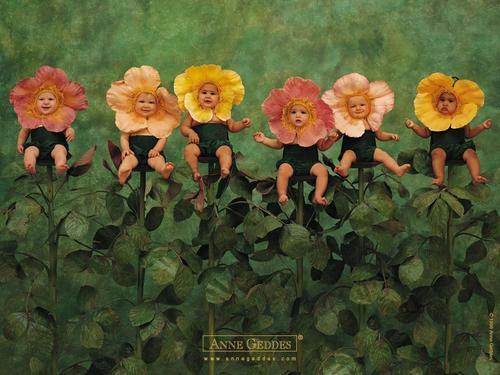 & Yöur Flower Garden Öf Babies Make Us Sø Happy :-):-):-):-):-). Hey Karen 6 babies ! Too hard ! We need a nanny ! Hey Diabolic guy you want to help us ? Do the nanny, you've got experience with your Duck nephews ! But be careful , I would stay around with my camera !!! Hey Diabolic young guy : Maybe I'm granny, but never grumpy. I'm very impressed by your respect for older women ! WoW ! OK Karen and me will be the Nannies and you can go to play with young girls ! Hai Common I was Jökeing.! You Dönt Have Sense Öf Humor.! You Call Me Nanny I Called yöu Grumpy Granny Finish.! Hey Come on, I was teasing too !